This is one of the titles for the role a young Zuni man performs when participating in the Shalako ceremony, which takes place around the winter solstice. The winter Shalako marks several days of concentrated spiritual observance and ritual practice meant to invite protective spirits into the community, so that sustenance and fertility are ensured. The main ceremony lasts a full night, and involves trained dancers wearing masks and personating the kachina spirits. The Deputy to the Sun, also known as the Little Fire God, is one of these dancers, and his duty is to follow the path laid out by the Sun Father deity, praying for rain, health, and prosperity for the people. The Deputy to the Sun is usually a young novice being initiated into the sacred rituals of the Zuni. Preparations for serving his duty include purifying the body, the heart, and the mind of interfering influences by observing celibacy and refraining from negative thoughts and emotions such as anger and aggression. 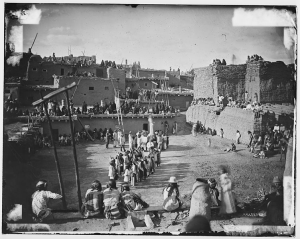 "Dancers at Zuni Pueblo, between circa 1871 and circa 1907" by John K. Hillers is licensed under Public Domain.